Home › Featured Local Businesses › Road Trip with Ellijay Tire & Williams Tire! Road Trip with Ellijay Tire & Williams Tire! Spring. It’s the time when trees start budding, grass turns green, winter clothes are put away and people start planning those spring and summer vacations! Planning that vacation takes a lot of thought – where to go, when, what to pack, etc. Then the day to leave comes and you can finally load the car and hit the road for some much needed R&R. But did you ever think about making sure your vehicle is also ready to hit the road? Some things to check are fluid levels, wipers, brakes, and tires. Ellijay Tire and Williams Tire checks your fluids when you get an oil change. To get the best wear out of your tires, keep an eye on your tire pressure and they need to be rotated every other oil change (or every 6-8 thousand miles). Not rotating your tires will result in uneven wear and cause them to wear out faster. The mountains are beautiful, but the curves can also wear out your tires faster. Our shop offers a road hazard program that covers rotations, tire repairs and if the tire is unrepairable we will replace it! Air pressure is another important thing to check periodically. Did you know that the correct air pressure for your vehicle is on a sticker on your door frame? You should check the air pressure in your tires every few months. Air gauges aren’t that expensive and can easily fit in a glove box or with your spare tire. And while we’re talking about spare tires, checking the air pressure in your spare is always a good idea! Another good thing about spring is that spring is usually when tire manufacturers start having their rebates! If you’re needing tires, spring is one of the best times to buy them. Not sure if you need tires yet? Check your tread depth with a penny. Hold the penny so that Lincoln’s head is touching the tire. If there is no tread touching Lincoln’s head, then you need to replace your tires. If you’re still not sure, feel free to stop by our store and we will be happy to check them for you! From checking your tire pressure for you (air is always free at Ellijay Tire and Williams Tire!) 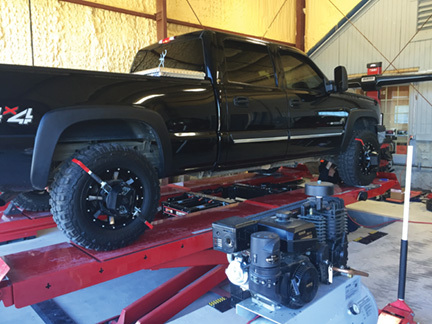 to doing your alignment, oil changes, and tires, we are always happy to serve you. Feel free to contact us via email at ellijaytirecompany@gmail.com, call us at 706-635-2322 (Ellijay Tire) or 706-946-2322 (Williams Tire), and check us out online at www.ellijaytire.com. location in any capacity we can!